With the session underway here in Des Moines, the fight to advance Stand-Your-Ground and Constitutional Carry legislation is in full swing. And while we work in the Capitol to advance this legislation, it’s important that we continue to mobilize as many gun owners as possible. That’s why Iowa Gun Owners will be coming to the Fort Dodge Gun Show next weekend — to get as many gun owners involved in this fight as possible! Location: Webster County Fairgrounds, 22770 Old Hwy 169, Fort Dodge, IA 50501. This is your time to sign your petition in support of this critical legislation! While you’re at it, you can join IGO and pick up a FREE T-Shirt as part of our gun show special. And if you want decals, “No Guns, No Money” cards, hats or more — you can get it all at the show! Also, if you can spare a few hours either Friday or Saturday, we’d love to have your help manning the tables at the show. We happily cover the entry fees of all volunteers and will make sure you leave with either a free IGO hat or T-Shirt as our way of saying thank you! If you can volunteer for a few hours, please hit the link below, fill in your information, and someone from our office will be in touch with you shortly. 2017 is our time to pass major pro-gun legislation, but we need every gun owner in the state pulling in the same direction. 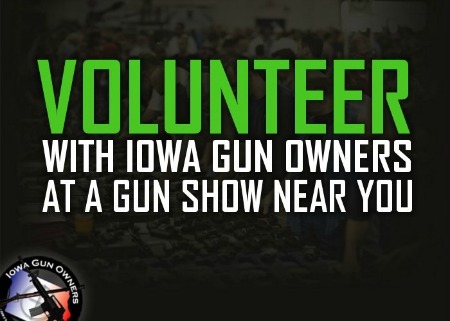 So if you’re in North Central Iowa, come out to the gun show and get involved! P.S. Next weekend, Iowa Gun Owners will be at the Fort Dodge Gun Show which is being held in the Webster Co. Fairgrounds, located at 22770 Old Hwy 169. We’ll be there Friday evening and all day Saturday! Come on out and support the pro-gun legislation we’re pushing at the Capitol, and join while you’re at it to pick up your free T-Shirt! And if you can, please consider volunteering for a few hours on Friday or Saturday. If you can help, we’ll cover your admission fee and give you some free gear! Hit the link below if you can help out! Iowa Gun Owners is PO Box 3585, Des Moines, IA 50323. You can call us at 515-309-7858. Our website can be located at www.IowaGunOwners.org. To view this message a a web-page, please click this link. Support the 2nd Amendment in Iowa – Join Iowa Gun Owners! To help Iowa Gun Owners grow our grassroots army, please forward this email to your friends. Where Should We Fight in 2017?